I thought I would have a post today about a fabulous baby shower I was supposed to attend on Saturday. However, the Bookish Baby had other plans. Apparently, she wants to attend the shower in person rather than in utero. Hence, the shower has been postponed for a teeny bit. So, rather than seeing pictures of adorable baby gifts and knits, I’ve got soup for you. I am a lover of soup. When the question “soup or salad” comes up, I almost always choose soup. And of course, when the weather turns cold, my meal planning thoughts turn towards soup. Last week I made “Roast Beef Soup” from an old Penzey’s catalog. It was fabulous. Simple to make and not too time consuming. Rich and meaty, but not a stew, definitely a soup. I thought I’d share the recipe with you all since it’s not on Penzey’s website anywhere that I can find. Preheat oven to 375°. 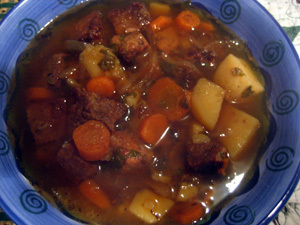 Cut large pieces of stew meat into smaller piece if necessary. Peel and slice carrots and onions. Place the beef, carrots, onions and parsley in a roasting pan, sprinkle with pepper and garlic, drizzle with vegetable oil and toss to coat. Put pan in oven and cook for 1 1/2 hours, stirring once in a while. Bring the water to a simmer in a soup kettle, remove the beef and veggies from the pan and add to the soup pot. Drain off any fat that has accumulated in the pan, then use some of the water from the soup pot to deglaze the roasting pan, using a wooden spoon to scrape up any tasty browned bits from the bottom of the pan. Pour this back into the pot. Once everything is simmering, add the potatoes and salt, and simmer until the potatoes are cooked – about half an hour. Taste before serving and add more salt if desired. Serve it up with some crusty bread and think of me while you nourish your body and soul with the goodness of soup. Oh that looks good. I think I’ll make that later this week! Congratulations to the Bookish family! The soup looks yummy. Mmm, soup. Grant has been making a great spinach, sausage and bean soup lately that really warms the innards. That looks just yummy. I make soup at least once a week during the winter months … it warms the soul better than almost any other meal, and can be made in a slow cooker. Win/win. I’m very excited for the Bookish Family. Sophia is so cute. I’ve never heard of Penzey’s, but man, does that soup sound WONDERFUL! Yum – thanks for sharing. MMMMMMM…Now that warms me up! Can you hear my stomach growling from there? Your soup looks delicious–thanks for the recipe! Oh, don’t forget a glass of red wine! I am actually making beef with burgundy tonight, as my hubby is away for work and he — get this — doesn’t like beef. More beef stew for me! I am so with you on the soups. Last week my husband and I declared it the Week of Soups and made three different kinds, all delicious (a roasted curried butternut squash soup, a black bean soup, and a potato leek soup). There is nothing more satisfying in this weather than to eat a hearty bowl of soup and then knit some warm wool while digesting it. mmmmm! i love soup — thanks for sharing the recipe. Yum. Thanks, Carole! Every school in our area is closed today due to wind chill advisories (-35 or so) and if that’s not soup weather, I don’t know what is! Yum! That looks and sounds wonderful. Thanks for sharing. Thanks for the recipe – sounds delicious! Hmmm, I think soup will be on the menu for much of my week at the farm I’ll have to bring this recipe with me as my mom and dad would eat that, but not my DH who is stay home. Oh, I KNEW I liked you! Soup, glorious soup. Nothing like it from September to April. And sometimes a rainy July afternoon. That looks delicious, thank you for the recipe! My soups/stews have all turned out disappointing lately so I’ll try this one. never heard of penzey’s either but that soup looks really good. and i bet it would be excellent with a loaf of no-knead bread. Mmmm, that looks yummy. I have chili in the slow cooker today…it’s definitely soup season! I too love to get my soup on. Living in the great white North, it seems only natural. And I don’t know about you Carole but I know that I want certain kinds of soups at certain times, i.e., when I am sick it has to be chicken. Soup is divine and it is best served hot when it is soooo cold outside. Thanks for the recipe. I know what I’m having for supper tomorrow! Thanks for sharing. Soup is my wintertime lunch, almost consistently! This looks like a winner to cook up soon. Thanks for the recipe.